Quirky, thought-provoking, and SUCH a quick read. 2-5 page stories about afterlives you'd never imagine. 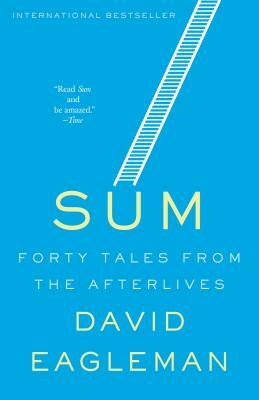 At once funny, wistful and unsettling, Sum is a dazzling exploration of unexpected afterlives—each presented as a vignette that offers a stunning lens through which to see ourselves in the here and now. In one afterlife, you may find that God is the size of a microbe and unaware of your existence. In another version, you work as a background character in other people’s dreams. Or you may find that God is a married couple, or that the universe is running backward, or that you are forced to live out your afterlife with annoying versions of who you could have been. With a probing imagination and deep understanding of the human condition, acclaimed neuroscientist David Eagleman offers wonderfully imagined tales that shine a brilliant light on the here and now. DAVID EAGLEMAN is a neuroscientist, a Guggenheim Fellow, a TED speaker, and a New York Times bestselling author. His books have been translated into 33 languages. Eagleman runs a neuroscience technology company in Palo Alto, CA, where he teaches at Stanford University and also directs the Center for Science and Law. He is the author and presenter of the Emmy-nominated PBS series The Brain. At night he writes.